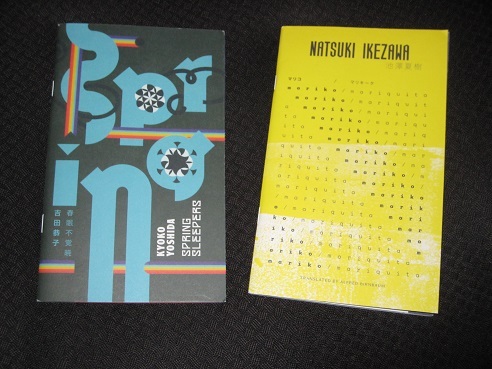 You may remember a post from last month where I introduced Keshiki – new voices from Japan, a series of eight chapbooks released by Strangers Press, a project associated with the British Centre for Literary Translation at the University of East Anglia (supported by the Nippon Foundation through Writers Centre Norwich). Today I’m looking at another two of the stories, one slightly more connected to real life than the other, but both have their own take on the stresses of modern society and the effect they have on our lives. 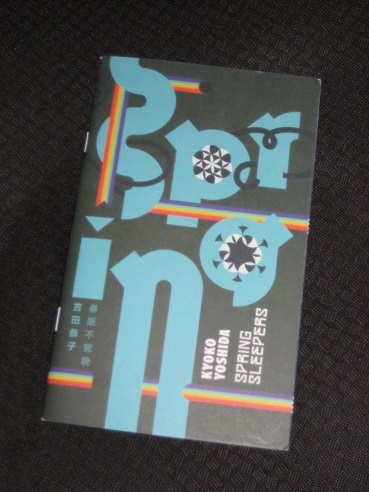 Kyoko Yoshida’s Spring Sleepers is a slightly bizarre tale, in which a young man called Yuki has been unable to sleep for more than two months. While he’s never felt better, the doctor’s diagnosis of ‘genuine insomnia’ comes with a warning as the contagious condition has the unwanted side-effect of gradually erasing the sufferer’s memory. Taking the doctor’s advice, Yuki sets off for a distant sanitarium where he hopes to get some sleep, but as events take a turn for the unusual, he begins to wonder whether he really is fully awake. Spring Sleepers is fairly strange, even if the language and handling are relatively normal. It consists of a series of scenes from Yuki’s travels, with the connection between them gradually becoming ever more stretched. Each short section seems to bring another slightly off-kilter encounter, from the kooky flight attendant on the first leg of his journey to the spy who’s convinced that Yuki (codename: Snow…) is his secret contact. By the end of the story, reality itself seems to be unravelling, as buildings and people start to appear in two dimensions rather than three, reflecting the alterations in Yuki’s sleep-deprived mind. During the days, he was nervous. Just the thought of another sleepless night burned him with anxiety. The anxiety of monotony. At night, he was bored. Night was forever. It was solid, unbreakable. Counting the nights he walked through and imagining more sleepless nights, he found the prospect of thousands of boring nights pathetically boring. There’s more than a sense here of a veiled criticism of modern life and the demands it makes on us. Quite apart from the insane work hours certain countries require of its people, developments in technology mean that there’s no need to sleep (indeed, you may well miss out on something if you do hit the sack) – apart from, of course, the biological imperative. However, Yoshida suggests that’s there’s something more intangible that we lose if we don’t slow down once in a while. 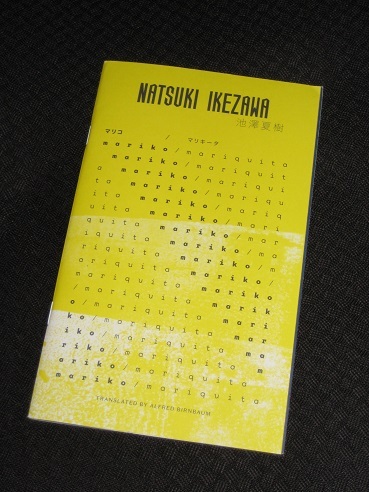 After Yoshida’s strange tale, Natsuki Ikezawa’s mariko / mariquita (translated by Alfred Birnbaum) comes across as a fairly run-of-the-mill story. Here we meet ethnological researcher Kyojiro Kizaki on a short interlude on Guam, with his three-month field trip to a more isolated island just around the corner. The twist in the tale comes when he encounters Mariko, a Japanese woman who came to Guam for a holiday and never left, and it’s no surprise that on Kizaki’s return the couple get together. mariko / mariquita is a nice easy read, much smoother and clearer than Spring Sleepers, and Alfred Birnbaum’s casual American take on the tale works well (Birnbaum was actually Haruki Murakami’s first translator, bringing his two early novellas into English for the Japanese market only, and there’s a distinct similarity in style here). What the story has in common with Yoshida’s piece, though, is its unspoken criticism of the workaholic Japanese lifestyle, with the reader urging Kizaki to throw caution to the wind, all the time knowing that it’s highly unlikely he’ll take the plunge. They walked around as if in hermetically sealed made-in-Japan capsules, safe in the camaraderie of their own temperate kind, clasping sweaty hands in the elevator, trying to hide their uncertainty about this strange land. They failed miserably. A congress of clumsy, insecure men and travel-constipated women. I loved the idea of this series, and think they look great, but have to be honest and say none of the chapbooks blew me away. They weren’t bad, but there wasn’t anything that made me want to read more by that author, which I think was a shame. I certainly didn’t feel that I was reading the best of new Japanese writing. My favourite was ‘mariko/mariquita’, and I was pleased to be able to read a new Birnbaum translation, which I felt was the most rewarding of the eight, the most cohesive. Anyway, I felt they were a bit of a missed opportunity and have subsequently passed my copies on. No keepers here for me.